Founded in 2008 as a 501c(3) charitable organization, the Yavapai Indian Foundation provides philanthropic support to the Yavapai Nation and its People. The Foundation’s main focus is to preserve the Yavapai heritage, culture and language through ongoing initiatives: encouraging healthy lifestyles; contributing to educational programs; building an assisted living center for the elderly; a new youth gymnasium and swimming pool; and many other worthy causes. As an enterprise of the Fort McDowell Yavapai Nation, We-Ko-Pa Golf Club is proud to host this special event on the Bill Coore and Ben Crenshaw-designed Saguaro Course, which is annually ranked as one of the top public courses in Arizona by GolfWeek magazine, one of many awards since its opening in 2006. Several sponsorship opportunities are available from Title Sponsor to Individual Player – all of which are greatly appreciated! If you’d like to learn more about the exciting opportunities for marketing exposure, charitable giving and a rewarding day on the golf course, please contact Raphael Bear at 480.789.5316 or via email at rrbear@fmyn.org, or you can also call Owen Doka at 480.689.2653 or email him at odoka@wekopa.com . To participate, please click the button below to complete the registration. Once completed, please return your form to Owen Doka via fax at 480.836.9001, or by email at odoka@wekopa.com, or fax your registration form to Raphael Bear at 480.789.5326, or email him your completed registration form at rrbear@fmyn.org. 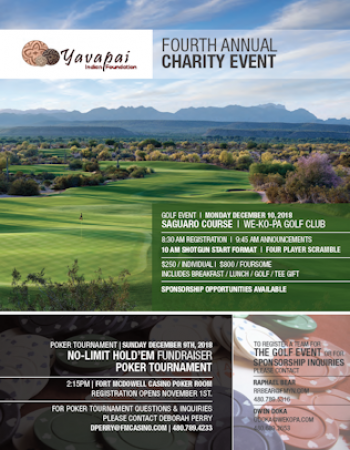 Our goal is to create an exciting day of golf and camaraderie, while raising funds and providing continued opportunities for the Fort McDowell Yavapai Nation. We appreciate your support, and we look forward to seeing you on December 11th! Download the Registration Form, print it out or save it. You can then complete your registration. Please return your completed form with your method of payment (check or credit card). We will contact you if there are any questions. By submitting my registration entry form, I agree there are certain risks inherent in the game of golf and I accept personal liability for all such risks. Registration: Begins November 1, 2018 $50 Cash Buy-in. Must register in person at the Casino. We’re proud to host the Charity Golf Tournament benefiting the Yavapai Indian Foundation. The tournament will be held on Monday, December 10, 2018 on the Saguaro Course at We-Ko-Pa Golf Club. All one-day tournament details are described in the flyer below. Please click on the Flyer button immediately below to download/print a copy to share with your friends. Or, click on the Registration button to download the entry form. We’re delighted to announce a new event the day before our 4th Annual Yavapai Indian Foundation Charity fund-raising tournament. 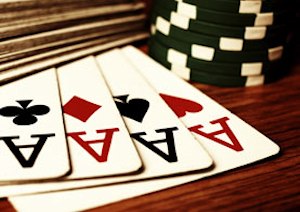 A No-Limit Hold’Em Fundraiser Poker Tournament will be held on Sunday, December 9, 2018 at the Fort McDowell Casino Poker Room.